- European Parliament’s Committee on Foreign Affairs postponed for Tuesday the presentation and debate of the resolution proposal of rapporteur Ivo Vajgl for Macedonia. The companies of Qatar are willing to cooperate with the Republic of Macedonia, said the Emir of Qatar, Sheikh Tamim bin Hamad bin Khalifa Al Thani, at his meeting with Macedonian President Gjorge Ivanov on Thursday. At the meeting, the first since Sheikh Al Thani's ascent to the throne, the two officials said they were pleased by both countries' commitment to developing further bilateral relations. 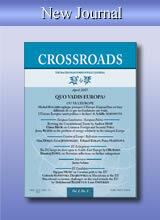 According to Emir Al Thani, business relations are expected to intensify in the period to come. As areas in which there is keen interest to promote relations, he highlighted agriculture, food production, construction, infrastructure, tourism, real estate and telecommunications. President Ivanov informed his host about the favorable investment climate in Macedonia, the performance of the Macedonian economy, and the positive assessments from relevant international institutions of Macedonia's economic reforms and results. Multilateral cooperation was also among the issues tabled at the meeting. President Ivanov's Office stated that it had been agreed that cooperation and mutual support in the system of the United Nations, especially within the framework of the Alliance of Civilization, in which Macedonia and Qatar play active parts, should continue. Emir Al Thani praised Macedonia's role in the Alliance of Civilizations saying the Macedonian model of honoring differences was a very positive one that should be further promoted within the framework of this global initiative. - Qatar investors are most interested in agriculture, food manufacture, construction, infrastructure, tourism, real-estate and telecommunications. On the first meeting with the Emir of Qatar Tamim bin Hamad Al Thani, fourth son of Hamad bin Khalifa Al Thani, President Gjorge Ivanov presented the business opportunities Macedonia offers, the economic condition and the assessments of the relevant international factors for reform processes and economic results. - The European Commission will stop giving recommendations for negotiations start for Macedonia, hoping that Greece will eventually remove the veto in the Council of EU, stressed Foreign Minister Nikola Poposki in an interview for the Macedonian Information Agency. The newly appointed EU Commissioner for Enlargement Johannes Hahn will try to persuade Greece to remove the formal blockage, said Poposki. Under the motto "MPs Running their Last Lap—REFORM MARATHON", students and professors will again stage protests outside the Parliament of the Republic of Macedonia Wednesday against the modifications to the higher education law that will be debated at a plenary session happening concurrently with the protests outside, Vest reports. The Student Plenum issued an announcement Tuesday appealing to students and citizens to counter these amendments together. "Dear fellow students and citizens, the modifications to the higher education law will be debated in the Parliament of the Republic of Macedonia on Wednesday. Let us give the marathon runners a proper welcome with a roaring applause and congrats cheers at the finish line of the race for bad reforms in Macedonia's education. "We invite all students and citizens to come with banners and whistles to root for the marathon runners in their exhausting race for the 'YES' button and for destroying education," reads the Student Plenum's announcement. - Macedonian President Gjorge Ivanov will be paying an official visit to the State of Qatar from 15 to 30 January, at the invitation of the Emir of Qatar, Sheikh Tamim bin Hamad bin Khalifa Al Thani. On Friday, he will also attend the first game against Tunisia of the Macedonian national team at the Men's Handball World Championship in Doha. VRANISKOVSKI’S RELEASE: TRAP OR SMART MOVE? The Public Prosecution is not going to appeal against defrocked bishop Jovan Vraniskovski’s early release because it believes he met the legal conditions for exercising this right. Bearing in mind Vraniskovski served more than half of his sentence; that his conduct was in keeping with all prison rules; that he fulfilled all his work responsibilities; and that the damage he inflicted with his illicit activities had been compensated for, the Prosecution believes all legal criteria for granting him early release have been met. If no other institution appeals against the Criminal Court's decision within the next five days, Vraniskovski will be released on 19 January and his parole will last until 23 March 2017. Vraniskovski's release is the condition for resuming talks between the Macedonian Orthodox Church-Ohrid Archbishopric (MPC-OA) and the Serbian Orthodox Church (SPC) with mediation from the Russian Orthodox Church over MPC-OA's autocephalous status. Analysts however are divided over whether Vraniskovski's release is truly going to propel things in a positive direction. - The traditional Carnival and Mask Parade in Vevcani starts Tuesday, and the organizers are expecting ten thousand visitors. BBC, world well-known TV, will film a documentary show for this original manifestation which depicts the old traditions. - Signing agreements on cooperation in economy, agriculture and culture between Macedonia and India was the main subject that Prime Minister Nikola Gruevski discussed on the sidelines of the global summit Vibrant Gujerat in Ahmadabad, India. Indian companies are welcome to invest in Macedonia's industrial zones, he said. Charlie Hebdo in France is the epitome of freedom of expression on all possible subjects. Intellectual provocation is crucial in building our thought, our democracy. Cartoons and humor are an expression of a fundamental right—the freedom of thought. "By attacking Charlie Hebdo because of its views, the attackers wish to frighten us, to freeze our thought so we would abandon the idea of freedom today and the idea of democracy tomorrow. We refuse to accept this barbarism and will never give in to intolerance and terrorism," said French Ambassador Laurence Auer at the commemoration held in the French Embassy in Skopje on Thursday. Asked if this tragic event had the capacity to divide the country, Ambassador Auer said the French society was completely united against the horrific attack. "This is a shock to all of us. The demonstrations across the country were for the 12 victims and 66 million wounded people. We are wounded in our souls, our essence, in what we are. Our democracy and press were attacked and this is unacceptable to us. We feel we wish to fight. We are furious and refuse to accept it. No one would accept it under any circumstances," she said. - Macedonian President Gjorge Ivanov sent a letter expressing his deepest sympathy for the lost lives in Paris to the French Ambassador to Macedonia, Laurence Auer. Prime Minister Nikola Gruevski also sent letters of condolences to his French counterpart Manuel Valls. The Professor Plenum sent a letter to the Government Wednesday demanding that the higher education bill be withdrawn. "We are particularly pleased to let you know that our only suggestion concerning the proposed amendments to the higher education law is: withdraw them immediately." The Plenum has also said that the debate conducted on Monday was illegal, illegitimate and very belated. - Former MEP Doris Pack, considers that EU is wrong not starting the accession negotiations with Macedonia but that is because of the regulation which enables the European Council to unanimously decide on the negotiations start. Prime Minister Nikola Gruevski promised in his New Year's address prosperity, more jobs, more foreign investments, higher salaries and pensions, and construction of roads and railroads. His address, which at moments resembled an election campaign speech, was in stark contrast to the address of opposition leader Zoran Zaev, who urged the people of Macedonia to unite in order to "liberate" the country. President Gjorge Ivanov also wished the people of Macedonia a happy new year urging them to build Macedonia with positive thoughts by the highest European values, criteria and standards. Prime Minister Gruevski announced at least 25 new foreign investments, continuation of the road infrastructure investments, a start of the construction of the gas supply network from Kumanovo to Stip, and providing conditions for the remaining primary gas grid across the country. - “There are things I cannot solve but also ones I cannot be stopped at”, announced the new EU commissioner for enlargement Johannes Hahn and stressed that he will strengthen the dynamics in the dialogue of the European Commission and Macedonia. Hahn will visit Macedonia in January and Foreign Minister Nikola Poposki confirmed that the Government will devote on the dialogue and will improve the weaknesses noted in Commission’s progress report. The governing majority failed to provide the required quorum to decide whether to take away the opposition MPs' terms of office on Friday and there is no information whether and when the follow up to the 28th parliamentary session will take place. What is known for certain is that the 31 legislators of the coalition led by SDSM will close this year as Members of Parliament. What will happen to their terms in early 2015 depends on how relations between the two largest political parties in Macedonia continue to unfold. The OSCE Ambassador to Macedonia, Ralf Breth, said over the weekend that legislators belong to Parliament and that SDSM should accept their seats. "The whole international community shares our opinion. The enlargement commissioner has recently said the same. As long as the situation stays like this, the situation will not be normal and we believe this should change as soon as possible," Ambassador Breth told Radio Free Europe. At his meeting with Macedonian ambassadors and consuls Thursday, President Gjorge Ivanov said that in 2015 the key role will be played by those of them serving in the neighboring countries and that time had come for turning a new leaf and for carrying out new tangible projects through regional cooperation. At the annual meeting at the Ministry of Foreign Affairs, President Ivanov urged ambassadors to make more effort in attaining Macedonia's strategic foreign policy goals, including European and Euro-Atlantic integration, good-neighborly relations, regional cooperation, reinforcing present and creating new friendships and partnerships, and promoting economic and public diplomacy. "Our diplomacy has to keep pace with the changing world. Only in 2014, we have witnessed tectonic changes on the political stage globally," Ivanov said. Prime Minister Nikola Gruevski did not give a straight answer Wednesday to the question of how the coalition led by VMRO-DPMNE would handle the situation with the opposition boycott of parliament after Parliament Speaker Trajko Veljanoski scheduled for Friday the session at which the opposition MPs' terms are expected to be taken away. Prime Minister Gruevski held a meeting Wednesday with the other parties of the coalition 'For Better Macedonia' at which one of the topics was the opposition boycott. Afterward he merely said the boycott was harmful, above all for the state and also for the opposition party. "SDSM does not have international support for what they are doing. We are conducting positive policies of investments and creating jobs while they are conducting a destructive policy, a policy of boycott. That is not good for the country," he said. - In the next couple of months Macedonia must join NATO or EU. If Greece disrespects the International Law then it should be excluded from the membership in NATO and EU. This is the attitude of Janusz Bugajski from the Center for European Policy Analysis in Washington according to whom the Union shouldn’t allow the name dispute to continue. Trade between Macedonia and Turkey should increase from the present 450 million dollars to a billion dollars. This is the goal that the Prime Ministers of Macedonia and Turkey, Nikola Gruevski and Ahmet Davutoglu, set during the latter's official visit to Macedonia on Tuesday. At the joint press conference, they said they were very pleased with the traditionally good political relations, which, they stressed, should be mirrored by economic cooperation. According to Gruevski, reaching a trade volume of a billion dollars is attainable. However, he added, "this does not depend only on us." "Our responsibility is to provide a good business climate and the rest should be accomplished by businessmen," he said. - Foreign Minister Nikola Poposki Tuesday met with his counterpart Mevlut Cavusoglu and discussed the bilateral relations. On the meeting they raised issues both from the regional and international collaboration and especially about the Macedonian aspirations for membership in the Euro-Atlantic structures, informs the Ministry of Foreign Affairs. Around 3,000 citizens staged peaceful protests Monday in protest against the amendments to the mandatory social insurance law. People of all ages to be affected by the legal modifications once they begin taking effect on 1 January 2015, including journalists, various media professionals, students, actors, musicians, and translators, took to the streets to express their disapproval with the obligation of paying the state as much as 37 percent of all fees exceeding the minimum wage of 9,590 denars irrespective of whether the fees are an only source of income or an extra income. 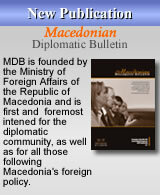 The numerous diplomatic and consular representatives contributed for the investment in Macedonia. We should remember this year for being successful and encouraging, announced Foreign Minister Nikola Poposki who Monday met in Skopje with the Macedonian ambassadors abroad. He assessed that for a small country such as Macedonia the good neighboring relations are very important being also one of the priorities in the foreign policy for 2015 focusing on the EU integration. The Government started its open session Sunday with issues relating to Macedonia's European integration. The Deputy Prime Minister for European Affairs, Fatmir Besimi, said that all reforms and activities in regard to Macedonia's EU and NATO membership bid will be included in the Action Plan 2015 and that the Government continued carrying out reforms in the public administration, media freedom, interethnic relations, good-neighborly relations and regional cooperation. Besimi said that this week would see the completion of the National Program 2015 based on which a public debate would be held in which representatives of the business community, private sector, academic community, and civil sector, including journalists, would be invited to take part voicing remarks and suggestions. - In the Assembly of the Republic of Macedonia Sunday were presented the state journalism and publicism awards “Mito Hadzi Vasilev-Jasmin” for 2014. Mirela Saiti and Fidanka Tanaskova were presented in the field of journalism and Borce Grozdanov in the field of publicism. At the very beginning of his annual address to the Macedonian Parliament on Thursday, President Ivanov stressed that by leaving their seats vacant, the opposition MPs left the voters who had voted for them unrepresented. Voting in elections, he said, is a civil right guaranteed by the Constitution yet representing voters in Parliament is a constitutional responsibility of elected deputies. The parliamentary session Thursday was also boycotted by the BDI MPs who refuse to recognize Ivanov's legitimacy. "Vacant seats cannot reflect the citizens' will. I wish to underscore than seven months ago, I invited political leaders, including Mr. Zaev and Mr. Ahmeti, to a meeting at which we would discuss our national interests. They ignored my invitation, which is still open. Refusing an invitation to discuss national interests to me is a reflection of utterly irresponsible political conduct. Therefore, I wish to tell those who are absent today that political dialogue is not a sign of political weakness but a sign of political maturity," President Ivanov said. President Gjorge Ivanov is going to address parliament Thursday for the first time in his second term of office. Today's picture of parliament will in fact reflect the changes that have occurred since the presidential and early general elections earlier this year. During his previous term, Ivanov had a chance of addressing two different parliamentary lineups bearing in the mind early elections were held in 2008 and 2011. In both cases, the opposition attended his addresses. This time round, however, it is said that almost two rows could be left completely empty taking into account the parliamentary boycott of the coalition led by SDSM and BDI's resolve not to recognize Ivanov's legitimacy. - Hungary assumes it has a moral obligation to support Macedonia in the Euro-Atlantic processes, and this stand will continue in the future, recommended the Hungarian Prime Minister Viktor Orban after the meeting with the Prime Minister Nikola Gruevski on the Summit in Belgrade. According to Orban “Hungary considers that the arguments of Macedonia must be taken seriously in order Macedonia to join EU and NATO”. - The Summit in Belgrade can be beneficial, since after the first two Summits, Macedonia started the construction of two highways supported by the Peoples Republic of China, announced the Prime Minister Nikola Gruevski after the first day of the meeting of “China plus 16” in Belgrade. - The prime ministers of Macedonia, China, Serbia and Hungary are going to hold a meeting Wednesday at which the construction of the fast Budapest-Belgrade railway will be tabled. This meeting will be held within the framework of the 2-day summit of the leaders of the 16 Central and Eastern European Countries with China that kicks off Tuesday (16 December).